I am a huge fan of Brooklyn’s Liddabit Sweets and their cookbook Liddabit Sweets Candy Cookbook tempts me like none other every time I open it (check out this slideshow of sample recipes). There are certainly plenty of marshmallow recipes around. Some made with only gelatin, some with egg whites and gelatin, and even vegan versions too. 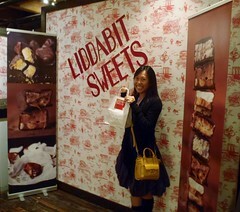 I happened to have an abundance of egg whites at home and trust Liddabit Sweets’ expertise. I adapted from their recipe for a Japanese twist. I bloomed gelatin powder along with 1 tablespoon of matcha (powder green tea). 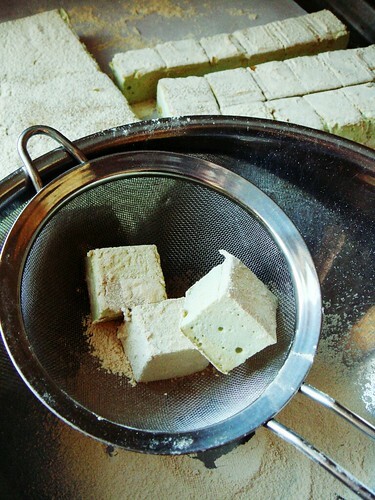 Green tea gave the marshmallows a lovely pale green colour and a subtle bitter taste to contrast with all that sweetness. For coating, I opted to use 1/2 cup of kinako (toasted soy bean powder) and 1/2 cup of confectioner’s sugar. 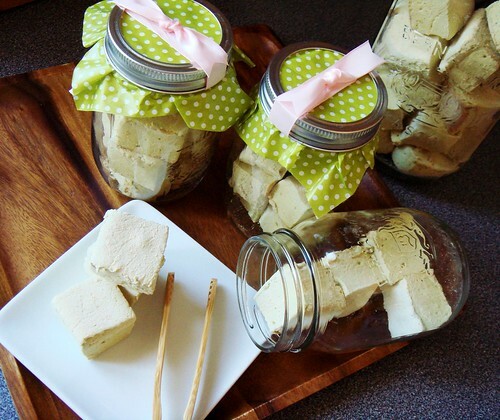 Kinako contributes plenty of flavour and its dryness functions just as well as the more commonly used cornstarch. 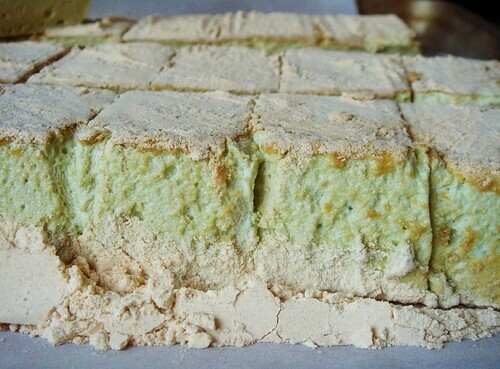 The coating was tinted beige but the gorgeous green marshmallows still managed to peek through. One of the best parts about homemade candies is the inevitable sharing that follows. 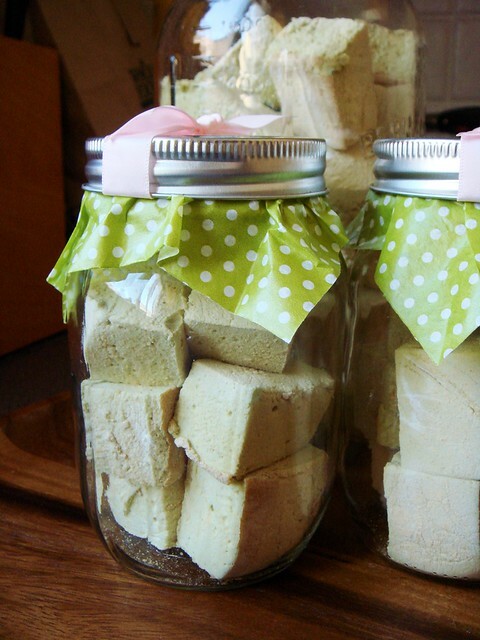 Once cut up, a 9x13 pan of marshmallow easily filled 8 500mL mason jars. 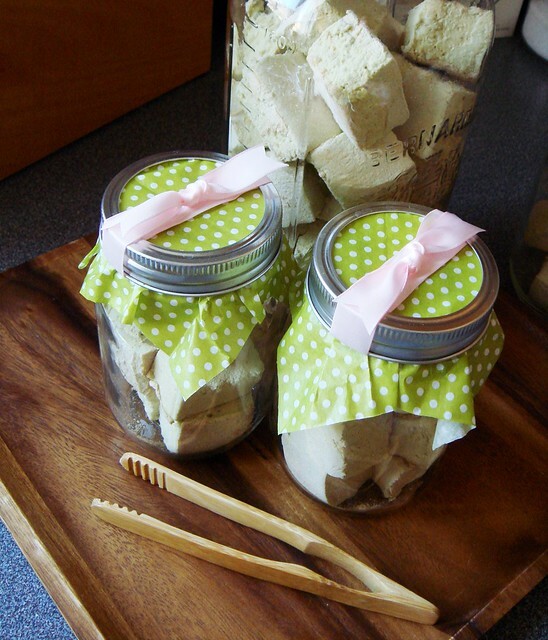 I dolled up the jars with matching green polka dot tissue paper and pink ribbon. 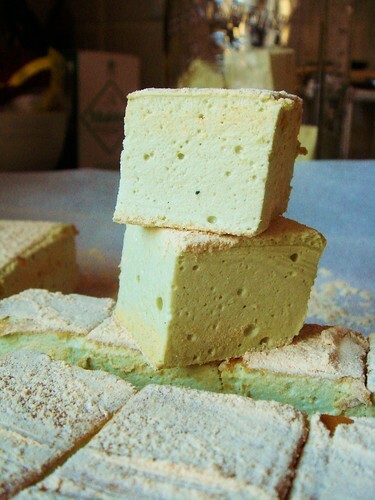 Holiday season may be long over but these Matcha Kinako Marshmallows are quite appropriate for St Patrick’s Day, don’t you think?